The University of Arizona is celebrating the reopening of Tumamoc Hill with the ribbon cutting ceremony on Saturday at 10 a.m.
TUCSON, Ariz. — The University of Arizona is celebrating the reopening of Tumamoc Hill with the ribbon cutting ceremony on Saturday at 10 a.m. The Tumamoc Hill road closed for two weeks, so crews could repave the one and half mile stretch of road. The road has new safety features. Crews painted a line about a third of the way in, so people can cross the line, and be away from cars that are coming. The repaving also helps researchers who have been using Tumamoc Hill as a place to study the desert for years. "The desert is pulsed based, and the only way you can understand that, is to study it for decades," said Ben Wilder, Director of Tumamoc Hill. "Biological data, long term data is gold. Tumamoc is a treasure chest." The public is invited to the ribbon cutting ceremony. 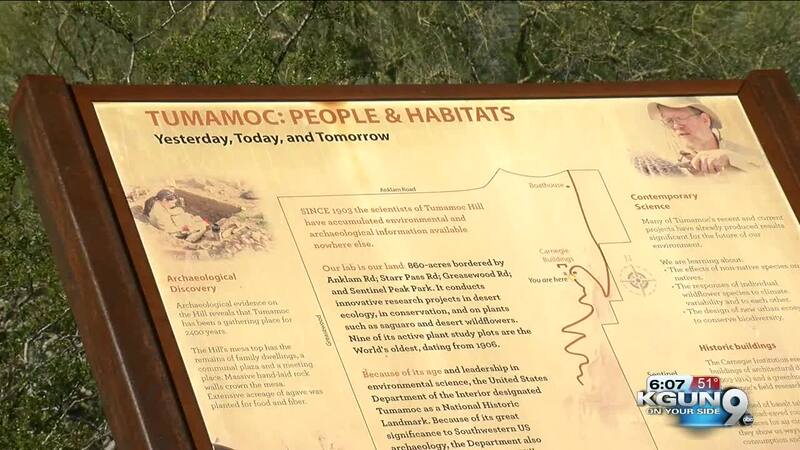 According to Wilder, Tumamoc Hill can see up to 1000 walking visitors a day.